St. Therese entered the Carmelite monastery at Lisieux after the 7:00 a.m. Mass on Monday, April 9, 1888. But that was not the only momentous event in the life of the Martin family that day. That same evening Celine, Therese's eighteen-year-old sister, received an offer of marriage. For more than a century the identity of Celine's first suitor remained unknown to the public. The first young man ever known to have proposed marriage to any of the Martin daughters, he was a Man of Mystery. I'd often wondered who he was and how he had become friends with the Martin family, who led a sheltered life at Lisieux. In 1997, when Bishop Guy Gaucher, O.C.D., whose knowledge of every detail of the family's life is unparalleled, spoke at a Carmelite conference at Marquette University, I asked him for the name of the young man who proposed to Celine the night after Therese entered. He answered "We don't know." Since then, further research has identified the suitor, for both the Web site of the Archives of the Carmel of Lisieux and Bishop Gaucher's exhaustive 2010 biography, Sainte Therese de Lisieux (1873-1897), divulge the name: Albert Quesnel. The Quesnel family, wealthy jewelers, were neighbors of the Martins. Their house, near Les Buissonnets, was also located in the parish of Saint-Jacques. Albert, their only son, was born July 16, 1858 at Lisieux, four days after the midnight wedding of Celine's parents, Louis and Zelie Martin, in Alencon on July 12, 1858. His family were close friends of the Martins, and he had known St. Therese during her childhood and until she became a Carmelite. He had given Celine advice in drawing and painting, in which he was gifted. This piece of news distressed me, not that I was undecided as to what I had to do, but the divine light, in hiding itself from me, delivered me up to my own fickleness; I kept telling myself "Isn't this offer, which is made to me the instant Therese leaves me, an indication of God's will for me, which I hadn't foreseen?" The Lord may have permitted me this desire for religious life up until now so that, in the world, I might be a strong woman. So many people tell me I do not have the makings of a religious! Perhaps, indeed, I haven't been called to that life by Divine Providence. My sisters never had to choose formally between the two lives; doubtless, God wanted them for himself, and he does not want me! In short, although my resolution had never changed, my anguish kept mounting and mounting . . . . I could no longer see clearly. Yet, just in case, I responded that I was not willing, that I wanted to be left in peace for the time being, and that no one should wait for me. (Celine: Sister and Witness of St. Therese of the Child Jesus, by Stephane-Joseph Piat, OFM. San Francisco: Ignatius Press, 1997, pp. 33-34). 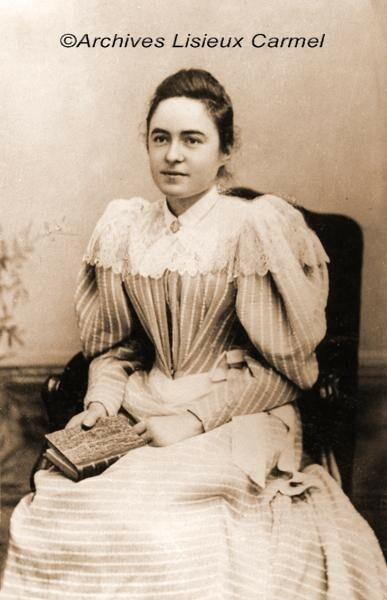 Therese was not the only Martin daughter whose vocation was beset with trials! After Celine refused his proposal, M. Quesnel decided to study for the priesthood. He continued to be friends with the Guerin family. Mme. Guerin mentions him in a letter, and on March 27, 1893, he was photographed while attending a reception at the Guerin home. See the group photograph at the Web site of the Archives of the Carmel of Lisieux. He was ordained, and he served as a parish priest in Ranville, where he died on May 11, 1935, and where he is buried. 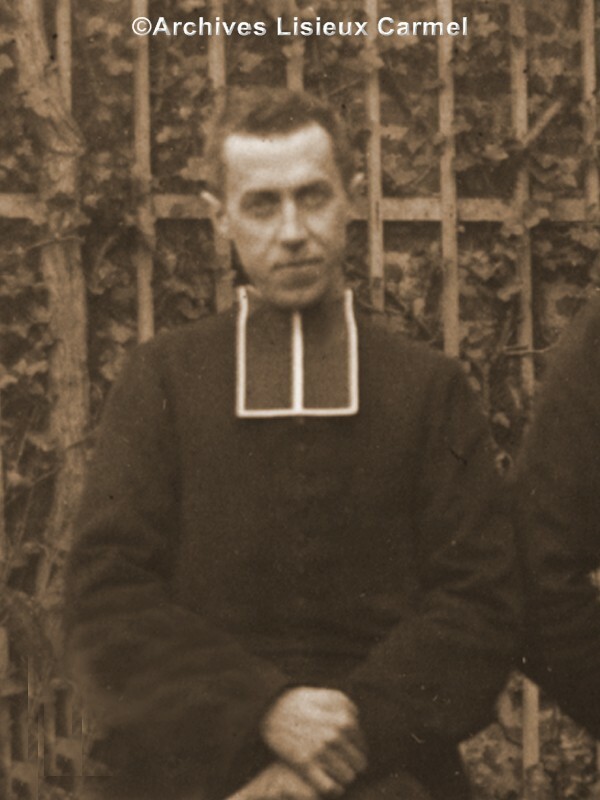 Celine, who entered the Carmelite monastery in Lisieux on September 14, 1894, more than six years after his proposal, outlived him by almost twenty-four years, dying on February 25, 1959. Except the text from Celine cited to Piat, the information in this article is drawn from Bishop Gaucher's Sainte Therese de Lisieux (1873-1897) and from the Web site of the Archives of the Carmel of Lisieux. I thank the Archives for permission to display their photographs of M. Quesnel and of Celine. To see many more photos and documents, visit the Archives Web site.